A walk-on punter in college, Carr instead developed into an outstanding wide receiver and was All-Southland Conference in 1972 and ’73. 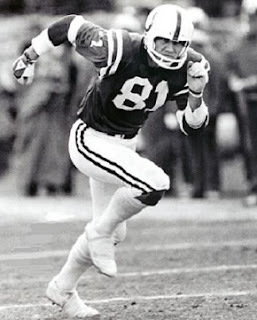 Overall, he caught 114 passes for 2717 yards and 19 touchdowns and was chosen by the Colts in the first round of the 1974 NFL draft (24th overall). With tremendous speed, Carr showed flashes of big-play ability, averaging 19.3 yards on 21 catches as a rookie and following up with 23 receptions for 517 yards and a 22.5-yard average in 1975. His two touchdown catches covered 86 and 90 yards. Colts went 11-3 to finish first in the AFC East while leading the NFL in passing yards (2933), total yards (5236), touchdowns (51), and scoring (417 points). Lost AFC Divisional playoff to Pittsburgh Steelers (40-14). The big breakout season in 1976 was followed by an injury-plagued year in ’77 in which Carr appeared in only seven games and caught 11 passes for 199 yards and a TD. He bounced back in 1978 with 30 receptions for 629 yards (21.0 avg.) and six touchdowns but injuries set in again in ‘79. With both he and star QB Bert Jones healthy in 1980, Carr pulled in a career-high 61 catches for 924 yards and five TDs, but his production again dropped off in 1981 and, following a dispute with Head Coach Frank Kush, he was traded to Seattle just prior to the ’82 season. Carr caught 15 passes for the Seahawks and two with the Chargers in 1983, his last year. Overall, Carr caught 271 passes for 5071 yards (18.7 avg.) and 31 touchdowns, with 254 of the receptions for 4770 yards and 29 TDs coming with the Colts. The 1976 season remained his best and the only one in which he received selection to All-Pro teams as well as Pro Bowl recognition.